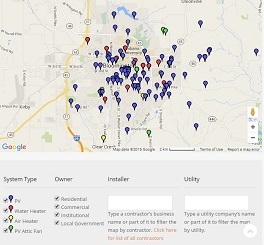 SIREN does not endorse or represent specific products or companies but we do make it easy for you to find solar contractors and related businesses. Get a contractor list here. Have you been thinking about “Going Solar” but don’t know where to start? SIREN volunteers will explain the performance, cost, and financial incentives. RSVP to an upcoming event today. Get up to speed quickly on the basic concepts and the value proposition of solar and renewable energy, plus what you need to know about contracts with the utility company. Homeowners, businesses and nonprofits in Bloomington and surrounding counties – Brown, Greene, Lawrence, Morgan, Orange and Owen – will have another opportunity to install solar panels at favorable rates in 2019 through the Solarize program. As an added benefit, Duke Energy customers will be able to lock in net metering incentives until 2032 for solar purchases made this year. For the third year, the City of Bloomington has renewed its partnership with SIREN to demonstrate its ongoing support for renewable energy. Solarize is a group-buy arrangement that removes the hassle and reduces costs for all participants through negotiated volume purchases. The program lowers the barriers to solar adoption by making it easy to go solar, while providing seed money for Indiana Solar For All grants to lower-income households. Residents of south central Indiana are already in a leadership role in the Midwest with more than 500 local solar owners. You can learn more about solar energy for your home, school or business by attending a one hour Information Session. If you want to sign up for one, click here. Since 2008, the Solar Indiana Renewable Energy Network (SIREN) has been a leading educator and promoter of renewable energy and energy conservation in the state of Indiana. As a project of the 501 (c) 3 non-profit Center for Sustainable Living (CSL), SIREN is a independent, non-partisan, volunteer-run group with a specific focus on promoting solar power including photovoltaic systems (generating electricity), solar water and space heaters for homes, businesses, churches, governmental buildings, and schools. SIREN’s main activity is presenting free public Going Solar programs at libraries, churches and civic groups. We help people learn about solar and renewable energy because one of the barriers to solar adoption in the Midwest is lack of awareness of its performance, cost and availability. Providing public outreach and education on energy conservation and renewable energy through events such as energy fairs, speaker presentations, films and demonstration projects. Promoting the adoption of renewable energy systems in our schools and other public buildings. Facilitating cooperation among renewable energy consumers, system installers, electric utilities and state and local government. Providing grant writing assistance to community organizations preparing to go solar. Visiting homeowners and providing a site pre-assessment of their home’s potential for solar panels, etc. Donations are welcome from individuals and business supporters who are interested in renewable energy. If you have a solar energy system in your home, be sure to ask about our “Powered by the Sun” sign! The SIREN community consists of hundreds of Indiana solar owners, installers, presenters, and green allies who communicate with each other by email over the public SIREN forum/mailing list, which you are welcome to join. We also hold informal gatherings where new and old members of the community meet to exchange information. Contact us if you are interested in attending one. These are the current members of the SIREN Steering Committee.